This month marked our very first DPPSI newsletter! Every month, Domains users receive a collection of opportunities to develop their personal or professional website, and information to help increase their knowledge of working with site-building software like WordPress. If you’re not already receiving these great perks, email newsletter@msu.domains to become a subscriber! 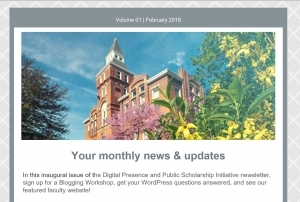 In this issue, we featured the Online Presence and Public Scholarship Fellows Program, a blogging workshop focused on helping participants develop or expand a blogging practice. To sign up, fill out this form before February 8th, 2019. Our plugin spotlight of the month was Google Analytics, a helpful add-on for when you want to see how many people visit your site, where they’re located, and how long they stay on the site. See our tipsheet here on how to install it! This month’s “Dear Joey” had Theme Trouble on Trowbridge writing in with a common issue: the installed WordPress themes look nothing like the example shown before installing! Unfortunately, there isn’t a quick and painless solution we’re all hoping for. You can try adding more content before installing themes, and also activating the plugin “One Click Demo Import”. It’ll get you closer to what the example website looked like, but in some cases, the websites shown are actually the paid version of the theme. So, to get a sleek site, you’d have to pay up. To avoid this, you can try relying on WordPress produced themes or the MSU Branded templates. Our featured faculty of the month was Dr. Casey Henley, a DPPSI Fellow in Fall ’16, and the Director of Online Programs in the Neuroscience Program at MSU. Her website, http://www.caseyhenley.com, was applauded for it’s stunning ‘Illustrative CV’. Newsletter recipients get the full details of every topic touched on here, so sign up by emailing newsletter@msu.domains to get filled in every month!